Warner Bros. Interactive Entertainment and Monolith Productions’ Middle-earth: Shadow of Mordor received multiple “Game of the Year” awards for its engrossing open-world action set in J. R. R. Tolkien’s fantasy universe. 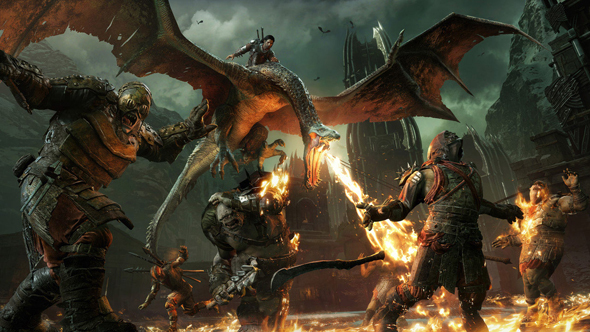 Rather than rest on the original game’s laurels, however, the development team is expanding on its strengths in a number of exciting ways for the highly-anticipated sequel, Middle-earth: Shadow of War. And there’s no better time to get hyped for Shadow of War’s launch. From now until October 16, when you buy select GeForce GTX 1080 Ti and GeForce GTX 1080 graphics cards, systems and laptops at participating retailers you will get your choice of UWP with Xbox Play Anywhere support or a Steam copy of Middle-earth: Shadow of War. The powerful GTX 10-series GPUs featured in the new bundle will also allow you to squeeze the most out of the next-gen sequel’s stunningly detailed visuals on PC. Here are seven key reasons why you won’t want to miss out on Middle-earth: Shadow of War. You can’t talk about 2014’s Shadow of Mordor without mentioning the Nemesis system, singing its praises, and wondering why it hasn’t been featured in every open-world action game since. The Nemesis system had a huge impact, turning an erstwhile familiar game about parkour and brutal melee combat into a game of fantasy chess. It turned enemies from anonymous HP sacks into bitter rivals, to be humiliated and executed, or dominated and forced to fight at your side. Rightly setting this system at the heart of the experience, Shadow of War once again pits you against an army of Orc commanders who gain or lose power depending on your interactions with them. This time, however, they’re not just roaming around the world map. Each commander resides in their very own fortress, and quite honestly they have a surprising flair for decor. These fortresses are huge, and kicking out their occupants is a more involved process than simply knocking on the door and slashing your sword around. These strongholds play host to sieges of epic proportions, bringing chaos, destruction, and high headcount battles to the fore. As in Shadow of Mordor, time passes when you die and respawn in the new game. That means if you die during the aforementioned epic siege, your foes have time to completely repopulate a fortress and re-establish their defenses. What’s more, whoever killed you will be that bit more powerful this time, and ready to rub your face in that defeat when you next cross paths. The flipside of that particularly grim coin is the sense of achievement that comes with overthrowing an entire fortress full of enemies, clearing it out completely, and re-staffing it with your own troops. In either scenario, your actions have meaningful effects on the world around you. A spot of LotR etymology: the word ‘Mordor’ comes from the Sindarin ‘Black Land’ and Quenya ‘Land of Shadow’. Both deeply appropriate descriptors of the place, and indeed the colour palette of the last game. In Shadow of War, however, the necessarily murky shades give way to a much richer and more varied set of biomes. This is a game about defeating Uruk commanders in their own fortresses, and each of those fortresses is situated in a unique ecosystem. 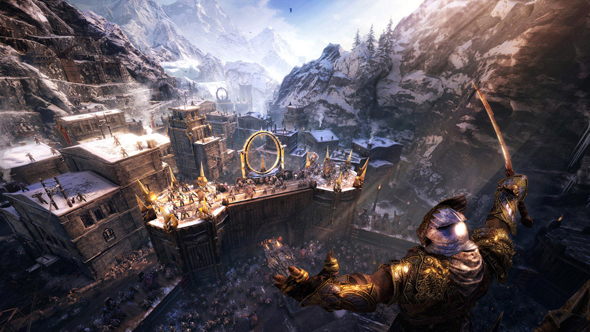 Hero Talion’s journey, then, takes him from snowy mountaintops to imposing spires and thick smog, and picturesque forests to war-ravaged ruins. He’s not there to take snaps, but it’s a feast of fantasy variety for the player. That’s Peter Jackson’s movies, to be clear, not some Gulliver’s Travels weirdness in which Borrower-sized Orcs fight on the esteemed LotR director himself. Monolith wanted to capture the sense of scale Jackson’s movies convey, and as such you’re often one among hundreds of individuals, all locked in battle. Shadow of War’s massive battle scenes are also perfect fodder for capturing with Nvidia Ansel, the technology built into GeForce Experience that allows PC players to take in-game screenshots of their gaming triumphs in breathtaking detail and then share those moments online. Firing off arrows from the back of a Caragor was all well and good in the original game, but Shadow of War expands the combat possibilities while mounting a beast exponentially. Now your combat options extend to passing melee swings as well as firing arrows, making it more feasible to remain on a mount throughout a battle. And, as previously alluded, airborne mounts are available, too. If you ever wondered just how comfortable it is to sit on a drake’s back, now’s the time to find out. Counters were an integral part of Shadow of Mordor’s bloody ballet. Now, with the right timing, they do more than just keep you from harm, instead insta-killing the foe who tried to attack you. It’ll take some practice to get down, but that high stakes mechanic has many a fireside post-battle anecdote in it. Speaking of bloody ballet, it suddenly seems an incredible oversight that no-one has adapted Lord of the Rings into dance form. Who wouldn’t pay to see Sauron’s soubresaut? 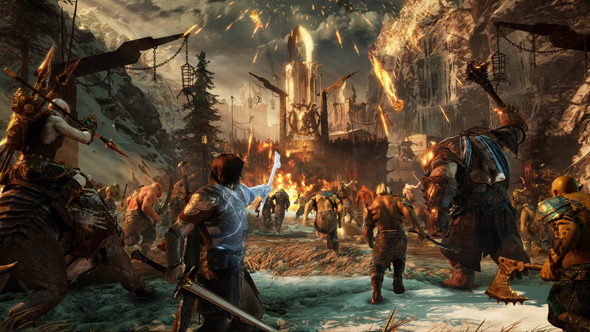 A recent addition to Shadow of Mordor added Nemesis Forge mode. It’s a new feature which works as a bridge between the two games, picking out the Uruks you interacted with the most in the original campaign and carrying them over into Shadow of War’s new pastures. So if you feel you still have a score to settle with your biggest Nemesis from Shadow of Mordor, you’ll get the chance to take him down again in this game. Likewise if you can’t imagine having anyone by your side but that one particular high-ranking Uruk you dominated last time, he’s got your back again here. Middle-earth: Shadow of War launches worldwide starting October 10. Get the game on day one on PC by purchasing the new GeForce GTX 10-series bundle here.